Blows, threats, insults, and obstacles are part of the aggression suffered by news teams during the marches against the tax reform that began on Monday. Included, a journalist of the Semanario Universidad was attacked by the Police on Wednesday night, as students retreated to the Universidad de Costa Rica (UCR) campus in San Pedro. The ‘Semanario’ journalist was attacked while reporting police aggression against the students. “The situation did not merit violence,” said Javier Córdoba. The worrying factor in that scenario, reported Córdoba, is that police chased the students onto the campus illegally. Experts argued the UCR campus is an autonomous State institution and the Constitutional Court has ruled, entrance by police is only by a warrant or in witness to a crime in flagrante. 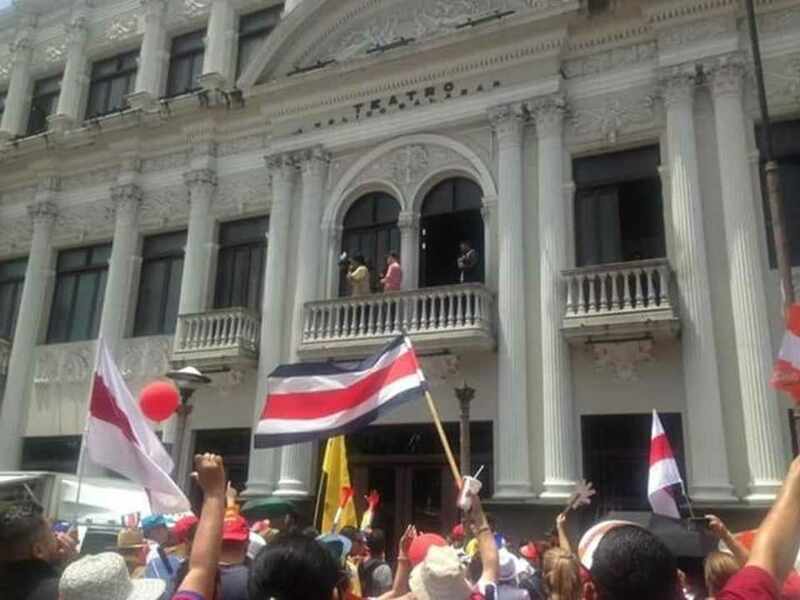 On Thursday, the transmissions of the television channels’ equipment were hindered by a group of protesters during the march that left the parapet of the University of Costa Rica (UCR), in San Pedro, towards the Casa Presidencial, in Zapote. “It’s a small group of university students who lash out at the press with insults. They are very aggressive,” said Roy Solano, a reporter for Repretel. According to Solano, the Thursday morning attackers rebuked him and his colleague, cameraman Carlos Cruz. “We knew that it was not wise to get into the march, so what we did was to get closer to the group as it progressed. We had not finished interviewing a person when they shouted insults at us. Several people surrounded us and covered us with a blanket because they did not want us to record,” Solano said. Solano affirmed that they did not receive blows but were pushed and insulted and the protesters attempted to turn off the recording equipment. “They would touch the cameraman’s camera to try to turn it off, they put their hand on the lens while recording. He was really worried that something would happen to the team. They told us ‘do not record’, ‘what we want is for you to leave’, you are this and that,” the Solano continued. Solano, who is a graduate of the UCR, added that the group is not representative of the place where he studied. Dudly Lynch, Telenoticias reporter, was also been a victim of verbal aggression and threats during the last three days. The first chapter occurring on Tuesday, while reporting the strike movements from Heredia. The second occasion occurred on Wednesday, during the demonstration that left the statue of León Cortés, in La Sabana, towards the Legislative Assembly. That day, to capture panoramic images of this protest, the Telenoticias team went up to one of the balconies of the Melico Salazar Theater, on Second Avenue. When the protesters spotted him from the street, they started insulting him. “I’m going to kill you, Linch; You’re one for which, they told me,” the reporter recalled. “We were doing a live shot for Buen Dia, but they should ‘thieves’, ‘evaders’,” Lynch said. Silvia Ulloa, director of CR Hoy, also said that several members of her journalistic team have been beaten and verbally assaulted in recent days. She commented when journalist Josué Alvarado and cameraman Róger Miranda reported the situation of those waiting to be treated in the pharmacy of the Calderón Guardia Hospital, on Wednesday, a security officer at the medical center lunged at them. “He hit them and the cameraman dropped his cell phone,” said Ulloa. 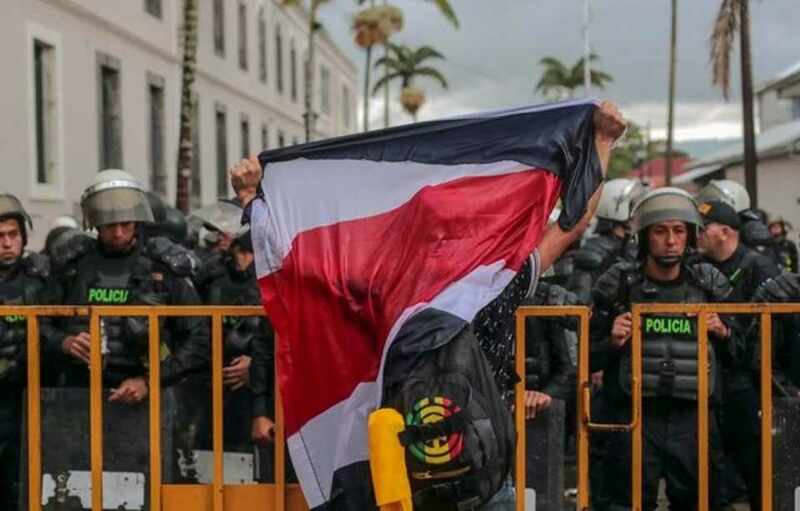 According to Ulloa, that same day, another of the CRHoy journalists, Jéssica Quesada, also suffered violence on the part of the demonstrators who marched from the statue of León Cortés, in La Sabana, to the Legislative Assembly. “There, outside the Assembly, they threw coins, stones, sticks, bottles with liquids,” said the Ulloa. She continued: “When we tried to make a Facebook live video, they interrupted us, they shouted expletives, they stood in front of the cameramen … the police had to protect them,” she added. At the end of the day Thursday, the unions and the government were in a stalemate: the union movement affirms that the protests will be maintained and President Carlos Alvarado is staying firm of not negotiating until the strike ends. The strike enters its fifth day today Friday.